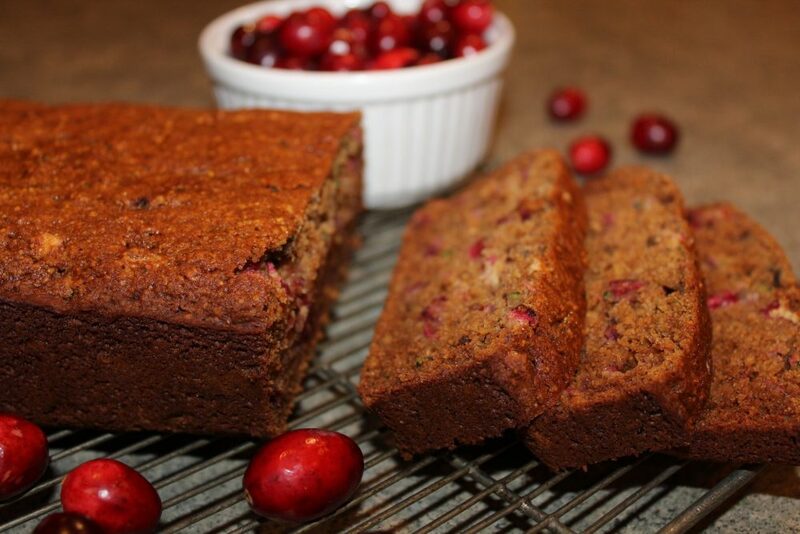 This newly created, gluten-free cranberry zucchini bread is a must addition to your holiday menu. It’s moist, full of flavor, and loaded with ingredients that can benefit your health. And the flecks of green zucchini and red cranberries give each slice a festive look for the holidays. Are you wondering why cranberries are good for your health? These little red berries are high in antioxidants, high in fiber, and low in natural sugar. They can help prevent urinary tract infections, improve digestion, prevent gum disease and boost your immune system. http://www.greenmedinfo.com/blog/beyond-urinary-tract-infections-five-health-benefits-cranberries. Simply add cranberries into smoothies, juice drinks, pancakes or a warm bowl of oatmeal. And what about the health benefits of zucchini? This green vegetable is low in calories, high in potassium, and rich in B-complex vitamins https://foodfacts.mercola.com/zucchini.html. Add sliced zucchini into your stir-fries, top off your fresh green salads with grated zucchini, or make some delicious cranberry zucchini bread! Preheat oven to 350° F. In a large bowl, beat eggs with a mixer until frothy. Mix in honey and butter/coconut oil. Grind oats in a blender, bullet or coffee grinder. Add oats and remaining dry ingredients. Stir in chopped cranberries, grated zucchini and chopped walnuts. Pour batter into a buttered 9” loaf pan. Bake 45 to 50 minutes. Remove bread from pan and place on cooling rack. This recipe can also be divided into 3 small loaf pans. Bake 25 minutes or until toothpick inserted into center comes out clean. To turn this into a kid-friendly treat, place liners in a muffin pan and pour batter into each liner. Bake 20 to 25 minutes or until toothpick inserted into center comes out clean. Remove muffins from pan and place on cooling rack. For more cranberry and zucchini recipes (Raspberry Cranberry Salad, Cranberry Vinaigrette, Zucchini Fudge Brownies, Italian Zucchini Boats) check out our book Eating Pure in a Processed Foods World®.